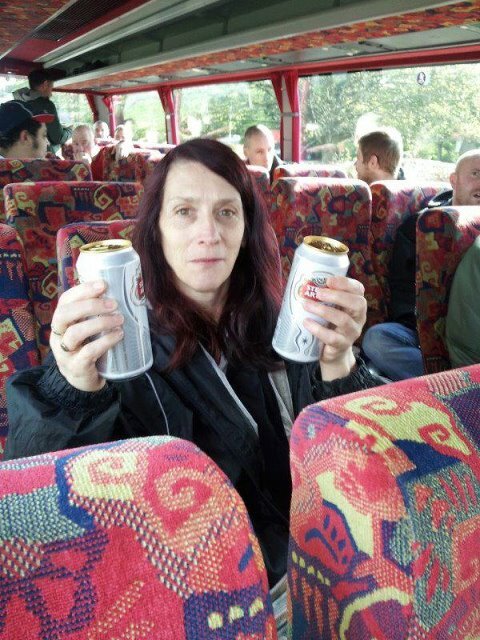 While the EDL were getting their pre-demo beauty sleep on Friday night, anti-fascists from Leicester were busy locking up the gates of GH Watts coach company, the company that has been ferrying East Midlands divisions around the country on their pointless excursions for a few years. 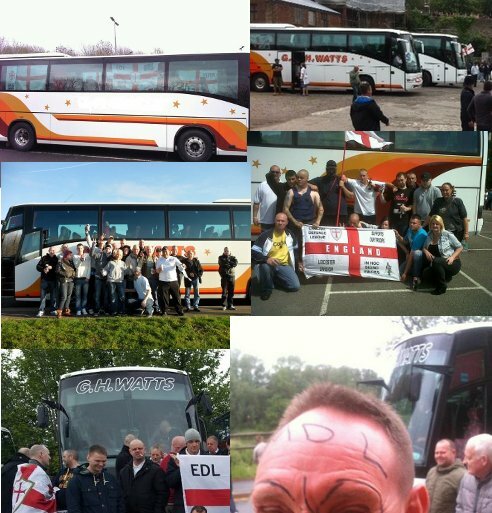 While the EDL aren’t admitting whether it had any effect on their travel plans, the action will certainly have sent a message to the fascist-enablers who run the company and might make coach hire a wee bit more difficult for the EDL in future. Well done Leicester Antifascists! Last night we took action against G H Watts coach company at their depot on Foxholes Road, Braunstone, Leicester. Their gates were D locked shut in a number of places and their locks were glued. We did this because G H Watts have consistently supported the EDL over the past few years. The EDL are nothing more than class traitors. Their leadership have formed an alliance with investment bankers and property speculators who send their army of useful idiots to do their bidding. They try to blame all of society’s ills on their favourite scapegoats, the Muslims, in the same way that the Nazis blamed Germany’s problems on the Jews. These attempts to divide the working class along lines of race and religion divert anger away from our real class enemies: capitalists, politicians and bosses. As antifascists we see it as our duty to combat the reactionaries of the EDL and all the tiny groups riding along on their coat tails. This includes taking action against companies that profit from their politics of hatred. For working class action against fascism! No pasaran! – they shall not pass. 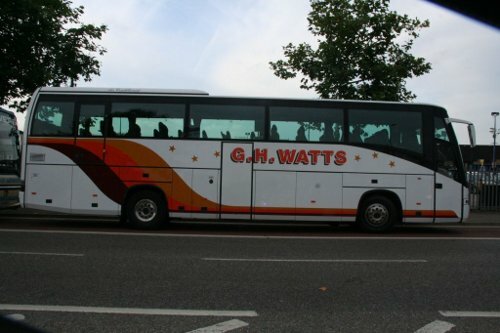 We have been exposing GH Watts’ role in servicing the EDL over the past year and have spotted their coaches at Walthamstow (Sep ’12) and Luton (May ’12) as well as Bristol (Jul ’12), Rochdale (Jun ’12), Hyde (Feb ’12), Cambridge (Jul ’11) and Blackburn (Apr ’11). Leicester and Nottingham divisions regularly travel in GH Watts coaches and sometimes they pick up Derbyshire members as well. Sometimes they’ve opted for other companies, such as Nottingham’s Silverdale coaches for their infamous trip to Tower Hamlets where the coach was attacked by anti-fascist locals and trashed. The hapless EDL were escorted off their bus by police who then arrested them all, leading Nottingham organiser Richard Carroll to release a hilarious ‘STATMENT’ on the Nottingham EDL site. It sounds like the EDL had a very bad day indeed yesterday. Less than 300 of them bothered to turn up for their national demo in Walthamstow and attacked their own stewards before their march was blocked by over 1000 anti-fascists. Tommy Robinson had to set up his gazebo in a backstreet somewhere and get pelted with missiles before the Met decided to nick all of his followers and kettle them for 7 hours before dispersing them throughout London. Facebook is now full of whingeing fascists threatening to get revenge on the OB, calling for Tommy and Kev to resign and saying that the EDL is a “laughing stock”. Hopefully this massive failure will mean another round of infighting within the already beleagured EDL and a further boost for the anti-fascist movement.